Heatsinks for Raspberry Pi are a popular accessory and are often recommended. Usually three pieces. One for the system-on-chip (SoC), one for the interface module and one for the voltage converter. Finally, equivalent building blocks in a full-size computer also have heat sinks. Now, there is no reason to miss Raspberry Pi heat sink. On the one hand, in the ground state, it is not that powerful that the chips can get so hot that they are damaged. The chips are designed so that no problems occur in the narrowest case under full load. Only if you overclock Raspberry Pi and operate it permanently at the edge of its performance, you could extend its lifespan with heatsinks. But who runs a Raspberry Pi in such a scenario, has quite different problems and should rather worry about a more powerful hardware. Does Raspberry Pi need heatsinks? The chips on Raspberry Pi board are designed for smartphones, tablets and embedded devices housed in small enclosures. Raspberry Pi is designed to be trouble free under full load and even overclocking. Only with older models was the cooling of the power supply recommended. But since the B + model that is fixed and the temperature in the rarest cases a problem. The default setting of the SoC of Raspberry Pi is that it will automatically clock down when it reaches 85 ° C. He can not get hotter then. However, it is extremely unlikely that the Raspberry Pi will even come close to this value during normal operation and use. There are two types of cooling: active and passive. Passive means that the semiconductor device to be cooled is equipped with a heat sink that dissipates the resulting heat from the heat source. 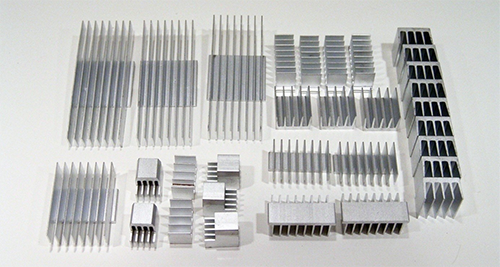 Typically, heatsinks are made of metal because the heat conducts with the best. For this reason, metallic bodies always feel cold. Simply because they extract heat from other bodies. In a closed housing heatsinks are actually too little for cooling. The heat accumulates in the housing and the heat sink will not make it any better. If you worry about the temperature, then you should create a breeze with a fan in the housing. That makes more sense than the thickest heat sink. Now if a semiconductor produces heat permanently, then it goes over to the heat sink and heats or heats it. But if the heat sink is hot or hot, then the cooling is limited by the heat sink. Especially if the whole construction is in a closed housing. The radiated heat then accumulates in the housing and the cooling effect through the heat sink will eventually achieve only a minimal effect. As a rule, this is remedied by taking the heat out of the housing. Sometimes it is sufficient if the housing is not completely closed, but has holes through which the warm air can escape. You can support this with a fan, possibly with a control circuit, which ensures an air exchange. That would be an active cooling. Why are heat sinks recommended? There are two groups of people who plead for it. Some come from the overclocking corner. The second group of people are sellers of Raspberry Pi accessories. Both argue almost equally. A normal computer is also cooled. So this has to be the case with the Raspberry Pi. Sounds logical, right? In real computers that are overclocked cooling measures are necessary, especially when overclocking necessary. This will then transfer the same need to Raspberry Pi. And therefore it is sometimes recommended to provide Raspberry Pi with overclocking with heat sinks. Salespeople have the same arguments. And if someone already opens the purse for Raspberry Pi accessories, then you can also make him even the need for cooling measures with heat sinks tasty. A few euros more makes some accessories package more profitable. The argument that it does not hurt is wrong. Such a heat sink does one thing above all else. He takes the chips to breathe the air. Especially in a small case. If you install a Raspberry Pi with heatsinks but no fans in a case that is wasted on metal and money. A Raspberry Pi is by no means comparable to a PC and the cooling there. He does not need one. The cooling of semiconductor devices has nothing to do with more power to "get out". Just because you're cooling a semiconductor does not make it faster. Also not a Raspberry Pi. There are few applications where a Raspberry Pi may need heatsinking, but only with a fan. For example, if it is over-used in an under-used housing that is constantly lit by the sun and therefore heated. But then Raspberry Pi does not have to be cooled, but the entire housing has to be air-exchanged. Heatsinks for Raspberry Pi and often on all other single-board computers are utter nonsense.